Khris created a nice font here (example). Perhaps we should open this up as a competition! KAnd when this is over, might I suggest another contest for a new AGS Awards client GUI? I don't know who is in charge of the AGS Awards client, but I'd be more than happy to help with that. As I said before, if you have a font, or are interested in making a font send it over and we will ask people to vote which one they want for the template (the font shouldn't be bigger than Jim's, otherwise it will be impractical for a 320x200 screen). That is a nice font indeed, but as Khris mentioned it is taken from a game. I was hoping to use an original font that came from the community (otherwise we may just as well go to the source and copy one of the fonts Sierra used). But again, if anyone wants to offer up a font they made, just post it here and we can vote on it. Please use a full TTF that also supports non-ASCII characters (e.g. German Umlauts, French accents,...). I think it is more important to have these than to have a completely new font. Most TTF don't look good at that resolution, but whatever font we use I will make sure to complete the extended version of it. If you are Ok with it, I will start the competition since I don't plan to enter it. I already won the icon bar one, and I think it would be nice to have different parts of the template made by different people in the community. we can use JimReed's font for now and gather fonts people made and are offereing for use over the time this template thread is running and at the end vote on a font to use, what about that? I'll surely vote on that, even though it sometimes is really hard to decide on a font. So how do we get people's attention to submit fonts when they don't read this one thread under way more interesting threads about new free adventure games in the forums? What about we create one post in this thread outlining what we are expecting from that font (not ripped from a game, made by the submitter, including all special chars (list them, post a template? ), TTF, something I missed?) and link to that from our forum signatures while this thread is running. yeah, great idea Snarky, sounds like fun again. I'd sure enter that contest, but let's focus on one UI at a time. The Background Competition is on! No TTF. I am willing to make all the special characters if the font is missing them, but no TTF. True Type Fonts are vector fonts, so we have no control over the rendering of the font to the pixel like we have with bitmap fonts, add to this that the template is 320x200, and the font will most likely look like crap due to the lower resolution. Cat is right about needing the font to have all special characters, so we can type words with Ç Ñ ß and all the crazy accents our languages use. Trust me, I want to be able to type CæsarCub with the right character whenever possible. I already provided those characters for JimReed's font, and I am willing to do that again if the font we use is a different one. All a font needs is to be small, readable and ideally created by the community. Because if we are stealing a font from a game, we might as well steal one from a Sierra game and call it a day. I'd say nothing bigger than JimReed's font because the template is 320x200, so there is not much space for a big font. Just to make clear: My point was not to use TTF, but to have all needed characters. Using existing TTF is just the easiest way to get existing fonts (with all characters) into AGS, but of course a pixel font is much better suited here. I feel the same way, that's why I wanted to state clearly that I was planning to add the extended characters to any font we end up using if those characters are missing. I know that using a TTF would be easier, but since the idea is to update the template with nicer art I believe it's worth the effort that the font we use looks good as well as being completely functional. 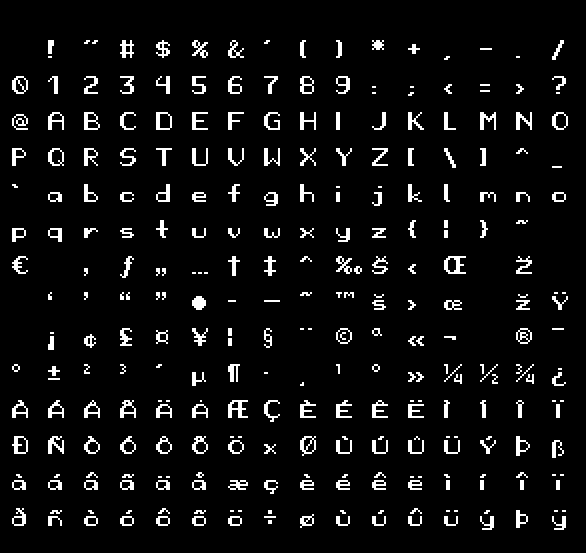 For the record, it's perfectly possible to make a pixel font in TTF, which – as long as it's imported at the intended point size – will be pixel-perfect in AGS. There are plenty of pixelart looking TTF fonts that work brilliantly with AGS. And apart from a few minor bugs with how AGS renders TTF fonts, they usually look brilliant, and are almost always indistinguishable from the bitmap fonts. That being said, I agree with you about the whole No TTF thing. Just for different reasons. TTF fonts are harder to make and edit, and can be a little unpredictable when using them to make a pixelart looking font. So I updated the first post with more links and images and colors. I wouldn't know where to link to for the fonts. Anything I missed? 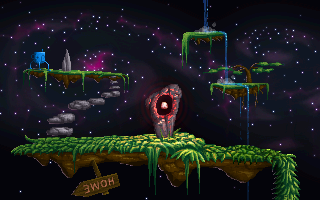 Well, it looks like we'll soon have an awesome background for the template. What's the situation with the character sprites? Are we set on the current one? Snarky suggested changing the skin tone to distinguish him from Sierra's Roger, which would require restructuring the whole facial area, because of the skillful palette choices. So, I did some editing, I kind of like the original ones more, but at least the hair and skin are separated and can be changed to whatever color. Is that something we should do? Whatever the choice, I'd also like to take a crack at a female version of the sprite. @CaesarCub - Did you only recolor the walking animations or also the rest of it? If not, I'd gladly recolor them and throw in some additional animations (reach for example). I did a quick palette swap on all the walking animations, so I have it in blue. But if you guys want to go for auburn Roger, just send it to me and I'll replace it. Doesn't really have to be auburn Roger, that was a random color choice by me. The only benefit of the edit would be easily swappable hair and skin tones, I was just wondering if it's worth it. I really like the skin tone changes, and I like the female Roger as well. I think it goes a long way to differentiating it from Roger. And not to get too political, but this also allows for a female person of color to represent the default, which is so often represented by white males. I've used that template myself, it's a nice one. I'm not particularly fond of the specific colors themselves, saturation is maxed out and the facial area is a bit low on contrast, but a variation of these colors might work and feel nostalgic. what is next? maybe the inventory? Next is the GUI elements that are missing. Buttons, borders, sliders... I'll start the contest later today or tomorrow. With that we will have pretty much a working template.